Environmental monitoring, permitting and health impact assessment. 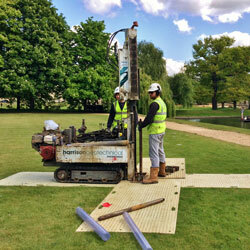 Targeted investigations and consultancy to solve geotechnical challenges. Contamination investigations, remediation design and compliance advice. High quality in-situ and UKAS-accredited laboratory testing. Harrison Group has carried out the ground investigation for installation of new Antony Gormley sculpture at Trinity College, Cambridge.